Mango Mania Dessert recipe by Rehana Riaz at PakiRecipes.com. Boil water to make the jelly according to the instructions of the manufacturer. Next, take sliced mangoes, cream and sugar, grind them in the grinder. 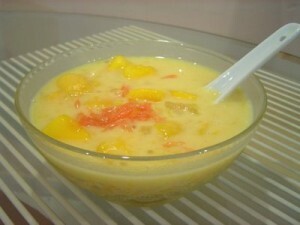 Slice bananas and place in a transparent bowl, then take the mango mixture and pour it in the bowl with the bananas. When the jelly is set, cut it in big cubes and decorate the mixture with jelly. Place in the refrigerator for one hour and is ready to have. Dig in!